Could this be the world's most casual heist? An artnapper has been caught on camera casually stealing a painting worth 12 million roubles (€162,000) from a busy exhibition in Russia on Sunday. 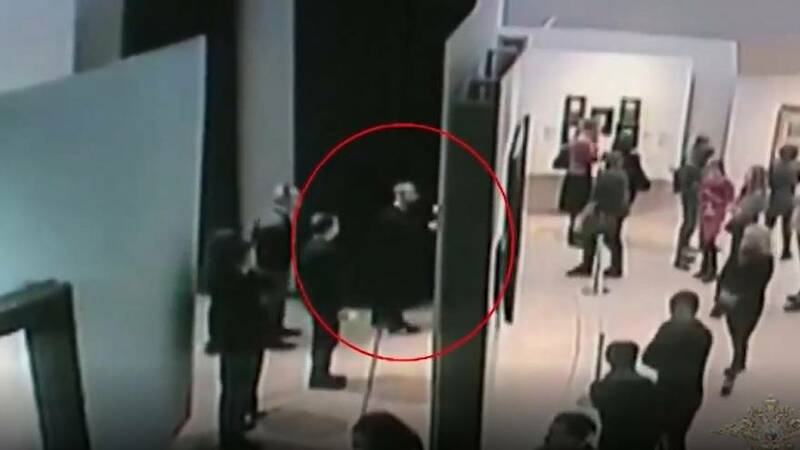 In the video released by the Russian Interior Ministry on Monday, the suspect is seen approaching the painting, which was part of an exhibition at Moscow's Tretyakov Gallery, before removing it from the wall and walking nonchalantly amongst art fans to exit the hall. The Tretyakov Gallery confirmed in a Facebook post on Sunday evening that the stolen piece was a 1908 landscape by Arkhip Kuindzhi, which depicts an area of the Crimean Peninsula. "Police and investigative authorities immediately started an investigation," the gallery said in the post. "Security measures have been reinforced at the Kuindzhi exhibition and at all venues of the Tretyakov Gallery." The suspect, a 31-year-old male, was arrested just hours after the theft in Zarechye, southwestern Moscow, the Interior Ministry said in a statement on its website. He admitted to hiding the painting in a building that is under-construction in the nearby Odintsovo neighbourhood, where it was later retrieved. "According to preliminary data, the crime was committed due to mercenary motives," the ministry said. "At present, possible accomplices of the detainee are being identified, and the investigation of the criminal case is ongoing."